The Sony Cyber-shot RX1 is the world's first digital camera to hold a 35mm full-frame sensor in a compact camera that can sit in the palm of your hand. This pocket-sized beauty is equipped with a 24.3 megapixel Exmor CMOS sensor, a BIONZ image processor and a newly developed Carl Zeiss 35mm f2.0 prime lens. Together, the above technologies ensure that images and full HD movies are sharp and full of life, even in low light. The RX1 is a highly advanced compact with intuitive manual controls, a wide ISO range from ISO 100-102400, a built-in flash, a minimum focusing distance of 20cm, high speed shooting at up to 5fps and full HD 24p/60i/60p video with manual control and audio input. 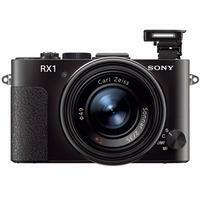 Smaller and lighter than any full-frame DSLR currently on the market, the Sony RX1 offers exceptional image quality and performance, comparable to that usually found in a high-end digital SLR.